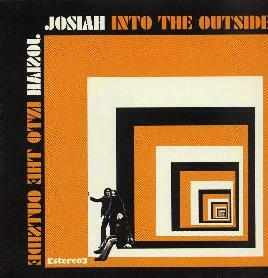 Josiah - "Into the Outside"
This is Josiah's second full length release. The band have released a few cool 7" records as well and recently toured with the Danish band On Trial in Europe. This three piece band really knows how to lay down the rock and roll and the record has a really cool sound to it. The CD opens with "Turn It On", to break things open. "The Scarlatti Tilt" continues the rockin' and has a great groove to it. "O.B.N." is the single from the record, a cool foot stomping number and short at 2½ minutes. I doubt anyone will play it on the radio, but who cares! There are a lot of cool mid-paced rocking songs on this CD ("Bloodrock", "Keep on Pushin'", "Beyond"). "Sweet Time" reminds me a bit of Nebula somehow. "Sylvie" is an acoustic ballad that really changes the mood of the CD. The CD closes with a jam ("Death Rides a Horse") that fades into the long 14 minute "Unwind Your Mind" (it has 4 minutes of silence in the middle!). This is one of the most adventurous tracks the band have ever recorded, beginning with some nice acoustic guitar that leads into a cool psychedelic guitar freakout! A great way to end the CD.